For the bones, you’ll want a big ol’ batch of bias tape. I recommend making your own, since you’ll save a bunch of money and you won’t be tied to whatever odd assortment of colors the nice folks at Wright’s have decided are worthy of bias-tape-dom. 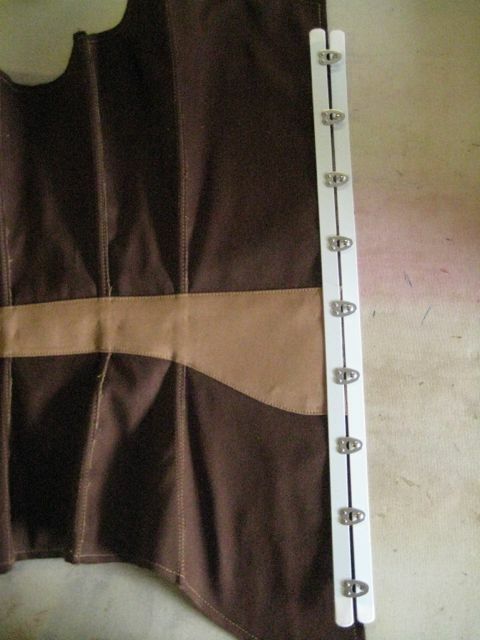 Bias tape will also figure into the “hide the ugly” portion of the single layer corset. 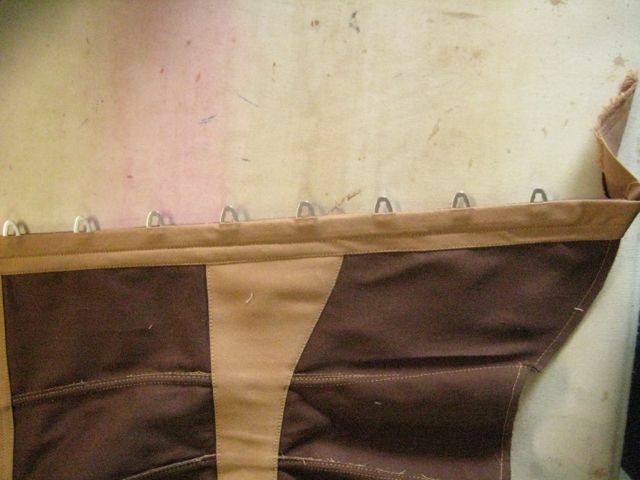 Start by sewing your corset pieces WRONG sides together. 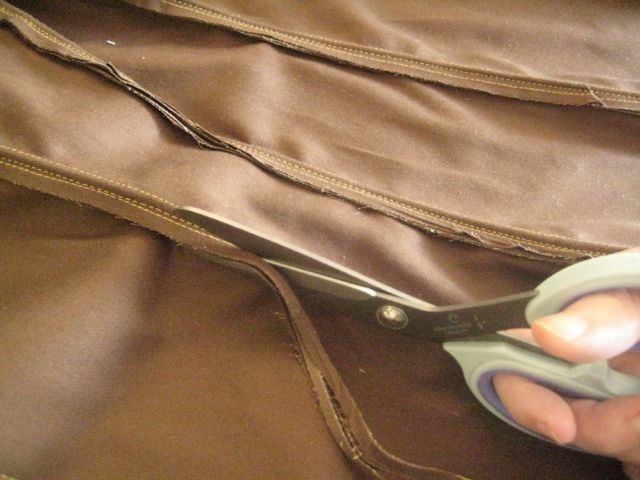 This will put your seams on the outside of the corset. 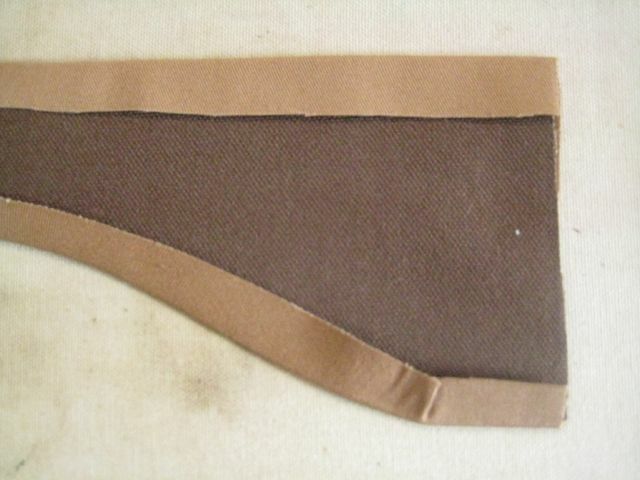 I’ve sewn my seam allowances down about 1/8″ from the original seam for extra strength, and I’m trimming them. 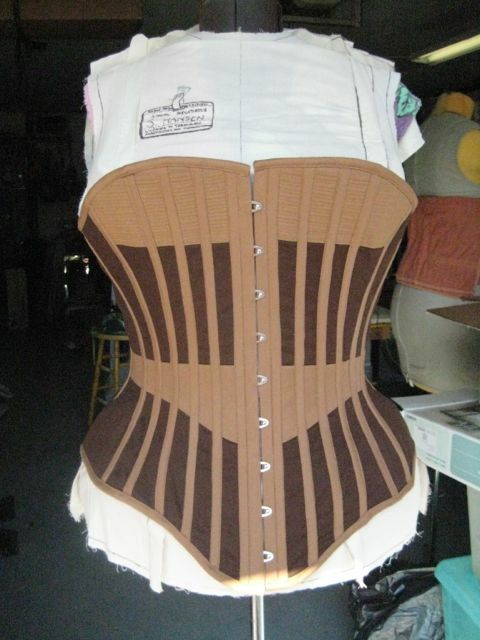 The design I’m working with has a decorative waist stay on the outside of the corset. (This is a good idea if you’re going single-layer with a waisted corset.) The real strength comes from duck cloth, but I’m covering it with the same twill I used for the bias tape. 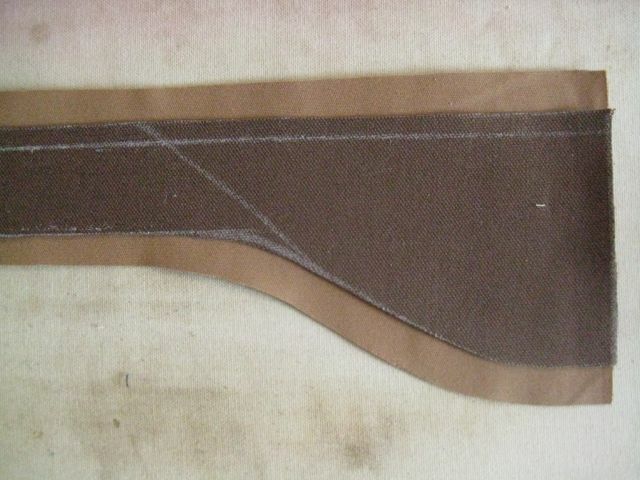 The fastest way to do that is to cut the business portion of the stay without seam allowances, whack out the pretty layer with something at least resembling your normal seam allowance, then iron the seam allowances of the pretty layer over the edge of the business layer. You’re looking at the back of the piece, btw. If that all seems like a lot of bother, you could just use a pretty ribbon. ;) Heck, you could use ribbons for the boning casings as well. I’m using bias because most of my casing lines are curved. Depending on the size of the bust you mean to support, you might want to add a second layer to the corset just at the bust. If you’re using a front closing busk, now is a good time to put it in. It’s way easier to do before the rest of the bones are in. Not sure how to put in a closing busk? Try this. I’m actually using these as functional boning channels, as well. 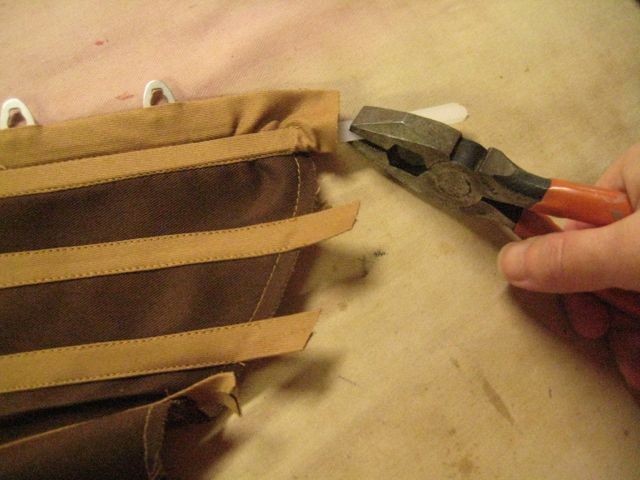 I find that boning the curved seams really helps shape the finished corset. Add the rest of your boning channels. Insert your boning. This can get a little dicey in the channels that have seams hidden in them, and where the boning goes over the waist stay. I like to use pliers to push the boning into the channels. It’s easier on the hands that way. 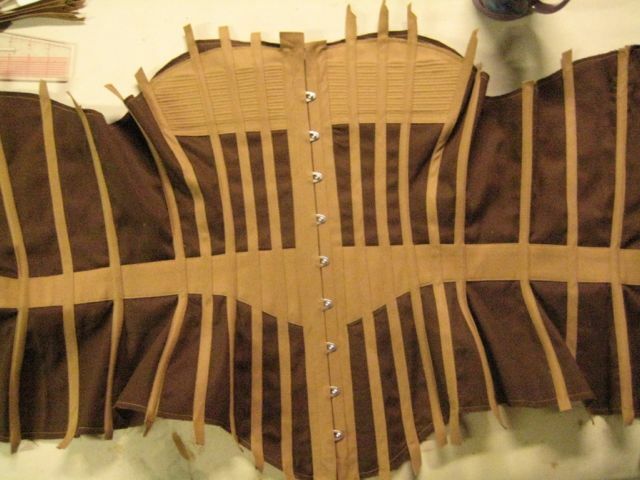 Bind the edges of the corset off with bias. Whack some grommets in, and you’re good to go. 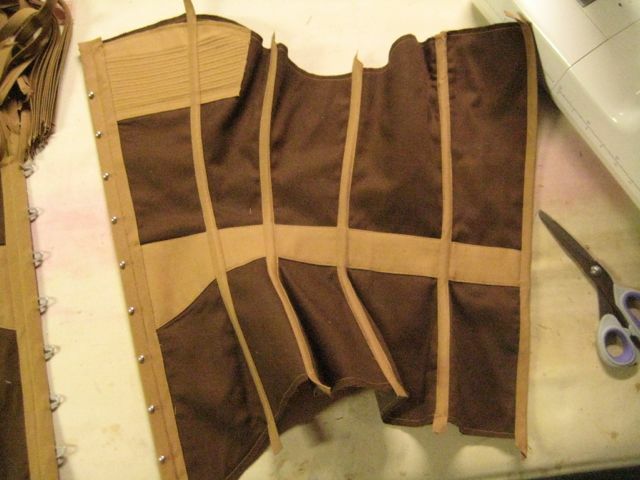 Here’s an inside view of the corset – you can see all of the stitching lines, but there aren’t any unfinished edges lurking about. (Flat-mount is a clever way of saying, “M ……? But where did the end go?! I am SO going to try this for next year? I’m going to try my hand at going all lady-like and this corset might make it half-way bearable in So Cali heat! Thanks! 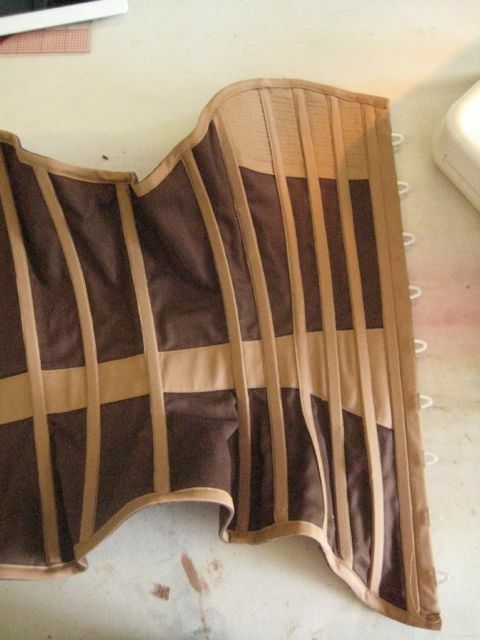 hey, I’m used to making corsets with coutil… this can never be as strong right? I’m very curious, please let me know! Great question! Do you mean the construction technique, or the use of twill and duck? Construction wise, this would be fine in coutil, but does not require it. Both the the fabrics I used share one of coutil’s greatest strengths, in so far as they are sturdy, relatively tightly woven cotton fabrics. That gives them both the strength and abrasion resistance that you want in a boned garment expected to take some strain – it’s one of many factors that help prevent the bones from wearing through. 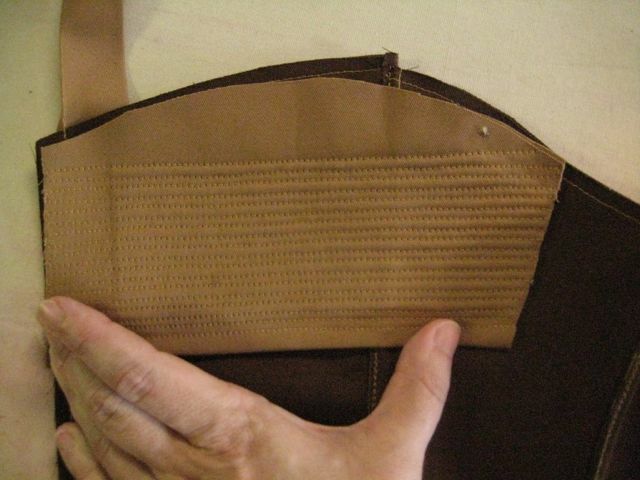 Whether or not coutil is the right fabric for your corset will depend a lot on the specific weave of the coutil and the type of corset being made. Coutil is specifically refers to type of drill (hence the name, french for drill) – a tightly woven cloth made of tightly spun fibers, generally cotton, in any variety of weaves. (Picket, 1999, pp.85). The strength of a fabric is a combination of its base threads (fiber and treatment) and the weave used. The weave also determines its suitability for different patterns. The coutil we see most commonly is woven as a herringbone twill. That weave gives it it greater bias movement than a plain weave, but less risk of long-term bias distortion than a single-direction twill. It’s great for multi-piece corsets without long seams on a relatively true bias – many of the Regency/Victorian/Edwardian corsets, through there are exceptions. 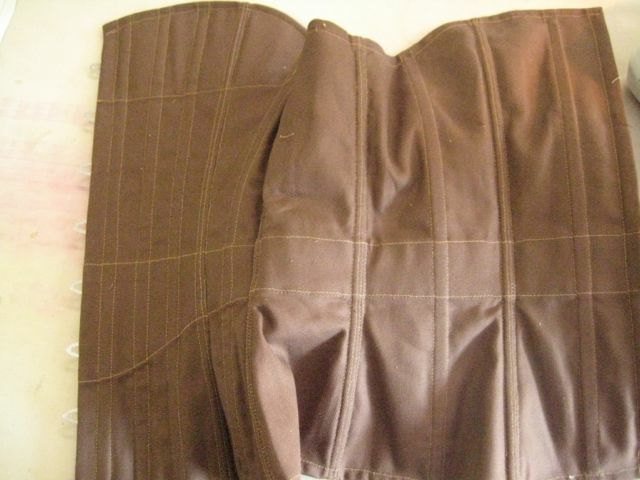 I’ve used it for 17th and mid 18th century corsets in the shop, and I find that it’s really not suited for early eras. The cut of earlier corsets, which use primarily straight lines for shaping, does not play well with the herringbone weave. My experience has been that the coutil wants to lettuce (ie, expand on the cut edge) when cut on a strong bias, and needs to be worked over with steam to get it back to rights. Sturdy plain wovens work best for those, though tight satin weaves* are also an option. Since coutil is relatively pricey, you should use it for what it’s best for (later era, unless you can get it in a plain weave). Picken, M. B. (1999). A dictionary of costume and fashion: historic and modern : with over 950 illustrations. Mineola, NY: Dover Publications. Curious what pattern did you use. I am my mother are using duck and denim to build a corset. I was very curious about your pattern. Hi, Lacey – The pattern was one that I developed off of a moulage (ease-less draft) for a client. It was a very simple mod – basically just nipping the waist in and moving the bustline up. I’m sorry, but I did not do a demo of that one. Hi, Pricila – I just centered the bias tape over the seam. Then the bias tape hides all the nasty bits of the seam, and there’s a place for the boning. There’s no magic. As long as you sew the bias on the edges and it’s mostly straight, you’re good.